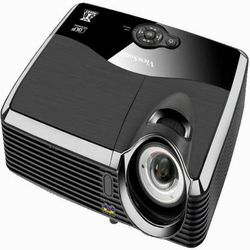 ViewSonics PJD5353 short throw DLP projector is ideal for use in the office or on the campus. It delivers amazingly clear images with 2500 ANSI lumens, 3000:1 contrast ratio and XGA 1024x768 native solution. With a short throw lens, it offers large images from short distances project a 50 image from only 2.3 feet away. The projector is packed with features like multiple PC and video inputs, HDMI for HD video signals, 120Hz/3D-ready for 3D applications and integrated speaker for multimedia. With ViewMatch technology adjusts color perfectly, so your presentations will be rich and vibrant regardless of any setting. This projector weighs only 5.7 lbs and is equipped with energy-saving Eco-mode which lowers power consumption and extends lamp life up to 6000 hours.